Although for many students season of job fairs won’t start until October, companies must already begin their activities, which will result in autumn. Job fairs are only seemingly easy to organize. But companies, which are aware of their employer’s brand, know that job fairs are perfect place to present organizations at theirs best. We prepared 2 key advices, which will help you systematize your knowledge about preparations to career expo and give you valuable tips to make it even better! We don’t mean arranging whole stand with neon colors, which are incompatible with your brand book. You can stand out for many ways. One of them – is arranging your stand in the way that won’t let people leave indifferent. It’s very important at the stage of collecting budget to think about stand, which won’t have size 1x1m2. However, if you have limited budget, remember that small space might be also arranged in interesting way. Experiment and don’t be afraid of controversial ideas! Bigger stand means more possibilities! You can create CV consulting zone with fast recruitment talks, contests etc. Next important thing is arranging your stand in agreement with your company’s branch. On no account don’t clutter up your stand with elements, which are united with your branch. If you worked in bank, flowers on your stand wouldn’t make you bigger interest of contestants. Give up on them towards bigger amount of gadgets! Not without a reason we called this paragraph “Challenge – materials”. Preparing good and involving materials for job fair is a real challenge. In reality it’s the most important part of preparations to carrier expo – so don’t let it for the last moment! First of all, begin from specifying what you want to contain on job fair’s materials. So, in a nutshell, which content is the most important for you. Definitely your attractiveness will be raised by non-standard shapes of leaflets, which are consistent with whole organization. 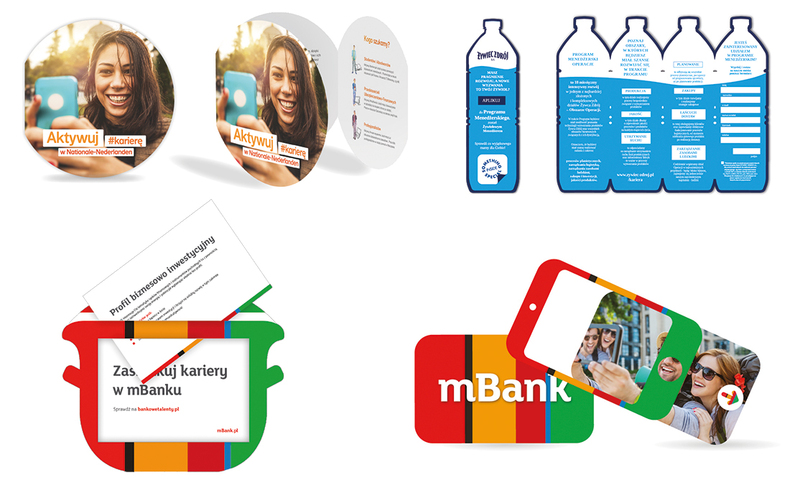 This solution was chosen by our clients: mBank, Nationale-Nederlanden or Żywiec Zdrój.